Description: CP 882 lead by BNSF 8854. Description: I seem to make beter time going down the road, Let me tell you. That some times it is not the case along I40 running by the trans-con in NM & AZ! This veiw is rolling north bounb on US Hwy 287 in near Marsh Texas north of Amarrillo. Title: SB loads on Fort Scott Sub. Title: BNSF 8854 rolls north thru stl. Description: BNSF SD70MAC 8854 leads a coal train east through Naperville as contractors strip down the CB&Q bridge in preparation for demolition. 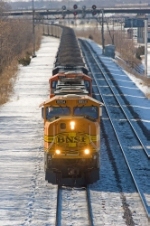 Title: BNSF 8854, CP's Tomah Sub. Title: BNSF 6232 leads a empty coal Nb. Description: really bad shot messed up the iso.